How To Avoid The Sharks! As a professional, providing testimony and rendering expert opinions in depositions and trials is a major cornerstone to your practice and your entire career. You can be an expert top-notch information gatherer, reconstructionist, researcher and investigator but if you can not present your findings in a formal legal setting, your rendered services are worth about zero. 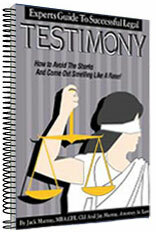 This outstanding work hands you the knowledge, techniques, tools and know-how so your testimony comes off successfully so you come out of it smelling like a rose even when opposition attorneys try to impeach your every word. Almost unheard of and extremely powerful content is based on the unique experience of two of America's best loved legal/investigative authors, Jack Murray and Jay Murray. Jack Murray has developed an impeccable reputation as a legal investigator and accident investigation expert witness who has testified at hundreds of depositions and trials. His unique, well known and highly successful legal testimonial approaches and techniques described in this book are powerful and hard-hitting. Jay Murray, a former legal investigator himself; is a practicing attorney who gives you amazing insight and knowledge from the other side of the witness stand on what to say and not to say. Aside from the wealth of excellent material covered on how to go about giving legal testimony, you are also treated to the framework of the law as it relates to your testimony. it in a PDF File. No shipping charges. AUTHORS WANTED If you have an investigative training manual we would like to see it for publishing consideration. Send your manuscript to the above address marked ATTN: Editorial Department. PUBLICATIONS AUTHOR? JUST CLICK HERE! RETURN TO MAIN MENU Copyright: 2010, Thomas Investigative Publications, Inc.